While the Royal Australian Mint's Master Collection - being auctioned on May 26 at Box Hill Town Hall as part of Downies Australian Coin Auctions Sale 319 - is in and of itself a special event, on account of every item in the auction being a special production unit coin and not included in the official mintage, we've picked out a small selection of items that we feel are extra special and deserve a bit of added attention. Particularly significant on account of being a gold plated version commissioned by the Royal Society of Victoria, only 500 coins were struck within the official mintage, with the above example being outside that mintage figure. Estimated at $300. This coin has rarely been seen and was struck as part of the United Nations Environment Programme. Little is known about this release but it should be noted that on this production unit the strike is noticeably weaker than the standard and piedfort versions, and as a result appears to be missing feathers. Estimated at $250. Struck for the 150th anniversary of the Eureka Stockade and in the highest rarity BU quality, this coin is especially significant for having no mintmark. The regular mintage of coins were produced for the ANDA show mobile press and as such carry a counterstamp. We expect a lot of interest in this coin. Estimated at $1,000. With a worldwide mintage of just 99 coins, this 74.77mm 1 Kilogram Gold Coin (in exquisite FDC quality) is undoubtedly the headlining piece of the Master Collection and sure to pique the attention of every collector, regardless of their ability to bid within the $60,000 estimate. Modern collecting is often marked by a fervent desire for collectors to acquire the new and innovative. It's not everyone's cup of tea, but these unique modern issues are highly sought after - as long as they are also high quality. For many years now, Downies has partnered with, and been sole official Australian distributor for, one of the most innovative coin producers in the world - Coin Invest Trust (CIT). Established in 1970, CIT is a European firm that has been producing coins since 1982. Over the years CIT have won a number of high-profile awards for their ground-breaking releases, including the Coin Of The Year award for their 'Gulo Gulo' Wolverine coin, part of the Wildlife Protection Silver Series. They are known for a range of ground-breaking numismatic issues, including the Pearl Silver Proof Series, the Tiffany Glass $10 Series, and the Meteorite Silver Proof series, to name just a few. The original Tiffany Glass offer made way back in 2004! As an indication of the popularity of some of their coins, the first of CITs Tiffany Glass $10 Series was sold by Downies for $139.95 in May, 2004. It is now selling at up to $4,000 on the open market! It's no mere fluke, either, as each of the coins in that series (and many others) have sold out almost instantly each year since! A big part of what makes releases by CIT so globally popular is that not only are they extremely innovative (3D coins with Butterfly wings, anybody? ), but they are also crafted to the highest standards. CIT don't just create new coins - they craft innovative, high-quality collector pieces that push the boundaries of modern numismatics. Downies is happy to partner with them and share their story with our collectors. With a whiff of sulphur hanging in the air, mingling with the tortured screams of non-believers, the lines have been drawn on the final battlefield for the fight between good and evil – Armageddon! The end of the world is currently firmly in the public consciousness, thanks to the link between the date December 21st, 2012 and the end of the Mesoamerican/Mayan long count calendar. A somewhat recent concern, many believe the ending of this calendar marks some sort of apocalyptic event. This view is not shared by scholars studying Mesoamerican culture, who argue that the Mayans expected the cycle to start again, much like the ending of a year in our standard calendar just means we need to buy a replacement for the fridge. The end of the world has long been a subject of fascination throughout human history, with some going so far as to ascribe a location to the event. A place that has been the particular focus of much Western prophesying and speculation about the end of the world – dating back to the Book of Revelation – is over 10,000km away on the other side of the earth from Central America. Tel Meggido – the Hebrew name for the place commonly referred to as Armageddon and the location of the final battle according to the Bible – is of great cultural and archaeological significance. Dating back to 7000 BCE, Tel Meggido has been the site of thirty different cities! A “tel” (or “tell” in English) is a settlement mound – a site where multiple settlements have built upon those existing previously through history; they are often places of great archaeological importance. Occupying a position of strategic importance for numerous kingdoms, especially Assyria and Egypt, during the Canaanite and Israelite periods, Tel Meggido has already been pivotal in a number of great conflicts and trade routes through the ages. In approximately the 15th Century BCE, the “Battle of Meggido” took place between Egyptian forces, led by Pharoah Thutmose III, and Canaanite states. This battle was important for a number of reasons; victory at this battle marked the start of the Egyptian Empires’ largest period of expansion, for example, and it was arguably the first reliably recorded battle in history. More recently, in 1918 during the First World War, Tel Meggido was the site of a battle between the Allied Egyptian Expeditionary Force and the Ottoman Yildirim Army Group, with the Allies gaining significant ground. Tel Meggido has also been the site of great cities at various times through the ages; for more information, see the Wikipedia entry on Tel Meggido. Due to this fascinating and significant history, UNESCO decreed Tel Meggido a World Heritage Site in 2005. The Bank of Israel has chosen Tel Meggido as the subject of its fourth coin in the ‘UNESCO World Heritage Sites’ series and it has been struck by The Holy Land Mint. The legal tender coin is issued in both silver and gold, with the silver available in 1 and 2 New Shekel denominations, and the gold available in a 10 New Shekel variety. Extraordinarily exclusive given the global significance of the theme, only 1,800 of the silver 1 New Shekel have been made, with mintages for the silver 2 New Shekel and the gold 10 New Shekel a mere 2,800 and a miniscule 555 respectively. The obverse of the coin features an 8th century BCE seal found during an archaeological dig. The reverse features a jug, and the surprisingly advanced aqueduct system discovered at this most remarkable location. With just 48 hours left for you to secure one of the remaining 10 coins in the Niue 2012 $100 Tasmanian Wedge-Tailed Eagle 1oz Gold Proof mintage, time is truly of the essence! A remarkable second release in what is destined to become a sell-out series, this superb full colour, one ounce gold proof is set to be one of the hottest releases of 2012! With only two day remaining before the mintage is officially closed forever – head on over to Downies.com or CLICK HERE for further information. Prestigious, desirable and highly limited, the 2012 $100 Tasmanian Wedge-Tailed Eagle 1oz Gold Proof is one of the most exclusive gold issues of 2012 thus far! The epitome of numismatic craftsmanship, each 1oz beauty is struck to the height of Proof quality from an entire Troy ounce of.9999 fine gold. A spellbinding legal tender issue, paying homage to one of the most renowned native Australian creatures – the Tasmanian Wedge-Tailed Eagle, each 38.61mm diameter flan is adorned in full colour upon a frosted background and mirrored field. Depicting the intricate detail of Australia’s largest raptor in fully struck-up high relief, this superb gold Proof is destined to command the attention of every collector who is enchanted by the unparalleled beauty and rarity of the world’s favourite precious metal! Restricted to a global mintage of just 150 coins, this prestigious, edge numbered Proof is only to be enjoyed by the privileged few! The ultimate tribute to a species facing the brutal realities of extinction, head on over to downies.com to secure what is sure to be one of the hottest issues of 2012! A pioneer in numismatic excellence, the Royal Canadian Mint has achieved the unthinkable - crafting to absolute perfection the world's first 10 kilogram .99999 pure gold coin! Proudly Canadian, this captivating design features the late Bill Reid's masterpiece; 'The Spirit of Haida Gwai', across its mammoth 180mm diameter reverse. A prestigious legal tender issue and a fine tribute to artistic expression, the 2011 $100 000 Spirit of Haida Gwauu is the highest denomination 10 kilo coin. With just 15 coins crafted for collectors of fine art and numismatic innovation, each coin is hand polished from the purest gold in the world. With every commemorative for 2012’s Year of the Dragon receiving an abundance of interest throughout the global market, the Royal Australian Mint has just announced the addition of two releases that no one anticipated to be issued into their product portfolio – comes a 1oz Silver Proof and a 1/10oz Gold Proof. Celebrating the world’s favourite lunar sign, each pad printed coin depicts the RAM’s signature dragon upon a vivid coloured background. Struck to the highest of Proof quality from .999 fine silver, the 40.00mm Silver Proof is restricted to a global mintage of just 18,000 coins. A highly exclusive, matching, 17.53mm Gold issue, crafted also to Proof quality from .9999 fine gold – this exquisite coin is limited to a mintage of just 8,000 coins. Issued as official Australian Legal tender, and struck specifically for an international corporate order – only a minuscule number of each the 1oz Silver Proof and 1/10oz Gold Proof will be available on the market – immediate action is needed to secure what is sure to be one of the most popular RAM releases yet! Celebrating one of the true icons of Australia’s natural and cultural history with the latest in 21st century minting techniques, this stunning tribute to the Tasmanian Tiger is most notable for its sensational Lenticular Moving Image. The reverse design features the very last of the species to die in captivity and has been created with the last known film footage of a live Tasmanian Tiger! An animal like no other, the thylacine resembled a large short-haired dog with a head like a wolf, a backward facing pouch like a wombat, a stiff tail similar to that of a kangaroo, and a striped body that gave it the name ‘Tasmanian Tiger’. The impact of human activity significantly contributed to the disappearance of the Tasmanian Tiger population, with disease, hunting and incursion into its natural habitat all having an effect. Considered a major threat to livestock, the last Tasmanian Tiger in the wild was shot by a farmer in 1933. It was in the same year that the last known surviving Tasmanian Tiger was captured and transported to Hobart Zoo and named ‘Benjamin’. The Tasmanian Tiger was notorious for its inability to survive long in captivity, and Benjamin died after only three years at the Zoo, passing away on the 7th of September 1936. The ideal subject for the application of Lenticular minting technology, this spectacular 40mm gold-plated legal tender coin captures perfectly the great beauty and fierce appearance of this intriguing, distinctive Australian marsupial. Enshrining a crucial artefact of Australia’s natural history within genuine legal tender, the vivid Moving Image design was created using footage of Benjamin taken by noted naturalist David Fleay at the Hobart Zoo in 1933. Given the employment of Fleay’s historic film, you could hardly imagine a more authentic, more eye-catching commemoration of the 75th anniversary of the death of the last known Tasmanian Tiger. A fantastic opportunity for our clients to enjoy this compelling combination of Australian history and state-of-the-art minting, the 2011 $1 Tasmanian Tiger gold-plated Prooflike coin represents outstanding value-for-money at the Official Issue Price of just $29.95! original footage of the last Tassie Tiger! coin is finished in 24-carat gold! Very affordable at Official Issue Price! Defined by a sensational Lenticular design, official legal tender status and flawless Silver Proof quality, this prestigious tribute to the 75th anniversary of the last Tasmanian Tiger is also notable for extremely limited availability. The mintage has been set at a crazy 3,000 coins! Like it’s gold-plated counterpart, the broad 40mm flan of this precious metal Proof features a vibrant ‘Moving Image’ design of Benjamin - the last known Tasmanian Tiger. A powerful illustration of the best in modern minting, this seamless, flowing Lenticular motif has been created from actual film footage of Benjamin taken by naturalist David Fleay! Complete with a Certificate of Authenticity attesting to the surprisingly low mintage of 3,000 - sure to sell-out at speed - this exclusive 25g sterling silver Proof is set in a plush case. The original footage which was used to produce the lenticular design! The 2011 $100 Tasmanian tiger 1oz Gold Proof - in full-colour high relief! One of the most desirable, most exclusive gold issues to be released in Australia, this exquisite legal tender coin forms the ultimate tribute to one of Australia’s most intriguing, most well-known native creatures – the Tasmanian Tiger. To be offered on a subscription basis, with orders taken only until the 15th of April, 2011, no more than 150 examples of this MASSIVE ONE TROY OUNCE .9999 FINE GOLD PROOF WILL EVER BE STRUCK! Produced by Swiss precious metal specialists Produits Artistiques Métaux Précieux (PAMP), this new release is a masterwork of numismatic craftsmanship. Struck to the most rigorous Proof standards from a full troy ounce of pure, lustrous .9999 gold, every collector will be impressed by the glorious full-colour motif, the sharply frosted background designs and the stunning mirrored field. Unquestionably one of the finest colour coins we have ever offered, capturing perfectly the distinctive appearance of the Tasmanian Tiger, the full-colour design has been created in fully struck-up high relief! Sure to command the attention of those enchanted by the unparalleled beauty, rarity and prestige of the world’s favourite precious metal – and the many people seeking coins defined by extremely exclusive limited availability – there is no doubt that the tiny maximum mintage of 150 will be achieved at super speed. 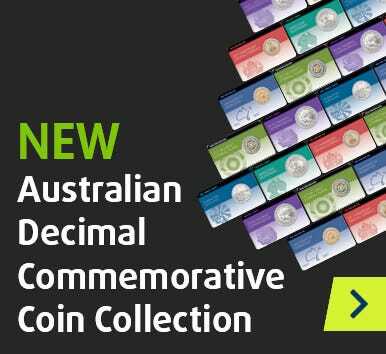 Indicative of demand for all large gold coins, the 100-coin mintage of the 2010 $100 Ned Kelly 1oz Gold Proof was over-subscribed in just SEVEN days! With only one hundred and fifty people ACROSS THE WORLD able to enjoy this prestigious, edge-numbered 38.61mm 1oz Gold Proof, the need for an immediate order is obvious. Incredibly exclusive, the ‘strike-to-order’ mintage has been set at just 150! Stunning full-colour design – created in fully struck-up high relief! Attesting to the exceptionally low worldwide mintage, with a mere 150 coins to be struck, each Gold Proof is distinguished by individual edge-numbering – matching the numbered Certificate of Authenticity accompanying each coin! THE ULTIMATE TRIBUTE! ~ Australia's Golden Era of Wool - Coin & Banknote Portfolio! Headlined by a large piece of genuine Australian Merino wool – as well as three Australian legal tender issues – this inspired presentation forms the most fitting possible tribute to the crucial role of the Australian Wool Industry in the economic, political and cultural development of Australia. To be enshrined in legal tender is to receive the ultimate recognition, and, illustrating the importance of wool to the Australian nation, the Commonwealth Government has authorised several legal tender issues devoted to the Australian Wool Industry. Issued between 1938 and 1963, with the design based on Uardry 0.1, a champion ram at the 1932 Sydney Sheep Show, the Ram’s Head Silver Shilling is arguably Australia’s most memorable predecimal issue. Three years after the last shilling was struck, Australia’s $2 note was first issued, bearing the portrait of ‘The Father of the Merino Industry’, John Macarthur. Twenty-five years later, the 1991 Decimal Currency 25th Anniversary 50c was unveiled, bearing an inspired design based on the original Shilling Ram’s Head motif. The perfect combination with which to honour the Australian Wool Industry, examples of the last Australian $2 note, the Elizabeth II 1953-63 Shilling and 1991 50c Decimal 25th Anniversary are united with the Merino wool in the 2011 Australia’s Golden Era of Wool Coin & Banknote Portfolio – all in pristine Uncirculated condition! Set within a large, impressive full-colour pack, featuring the history of the wool industry and a superb range of photos, this brilliant collection is sensational value-for-money at just A$69.95. Headlined by a large piece of genuineAussie Merino wool! Absolutely fantastic value-for-money at just A$69.95! Remarkable for the influence of a single breed – the Merino – the Australian wool industry was our major source of export income from the colonial period to the 1970s. However, beyond being key to the economic well-being of the nation, the history of the wool industry had a dramatic impact on Australia’s social, cultural and political development, playing a decisive role in the creation of the Australian national identity. Sheep arrived with the First Fleet in 1788, but it wasn’t until the introduction of Merinos that the wool industry began its journey to become Australia’s number one export – in large part due to the efforts of John Macarthur. One of the earliest settlers, Macarthur was the first Merino breeder, and a tireless campaigner for the export of wool to Britain in the early 19th century. Although others made a significant contribution to the history of Australian wool production, Macarthur’s vision, large scale wool export and support for the trade has seen him enshrined as ‘The Father of the Merino Industry’. In part due to the turmoil in Europe created by the Napoleonic Wars, the wool industry’s first boom time took place after 1813, with the first significant British auction of Australian wool taking place in 1821. Whilst the industry subsequently thrived, the 19th century was dominated by bitter conflicts between pastoralists and shearers. Whilst a lucrative business, logistical difficulties did bring heavy costs, and although advances such as mechanised shears and the replacement of shepherds with fencing, did ease the burden, employers still tried to cut costs by controlling shearers’ wages. United by a spirit of comradeship, shearers formed unions in the 1880s, with the battle against the pastoralists culminating in the shearer’s strike of 1890. This failed industrial action proved decisive to the history of Australian political life, with the first ALP branch meeting held in Queensland by striking shearers in 1891. Battling through drought, flood and fire, as well as two World Wars and the Depression, the wool industry remained Australia’s primary source of export income until the late 20th century. Continuing to play a key role in Australian life, the wool industry’s contribution to our national identity means that, to some extent, Australia will always ‘ride on the sheep’s back’.